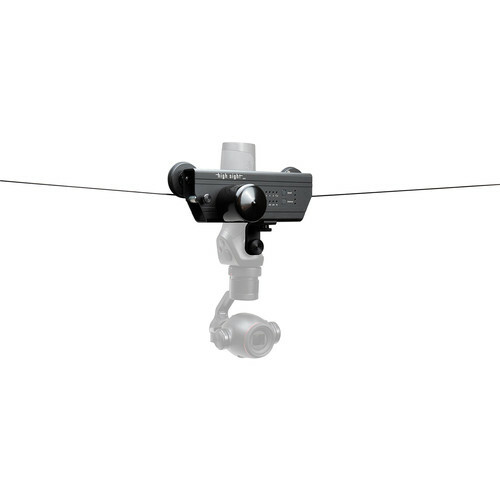 The High Sight Mini Cable Cam allows you to capture smooth overhead and other shots just about anywhere outdoors, including settings difficult to maneuver in with aerial gimbals, such as wooded forests. The Mini is designed to carry compatible gimbal cameras weighing up to 3.5 lb, including the DJI Osmo and GoPro Karma, along a robust 175' supplied reel. The reel can either be secured at two endpoints (using included carabiners) or secured at just one point and handheld at the other, allowing you the freedom to move around with that end in the latter scenario. The system is motorized and can be set to Auto mode at an assigned speed, or you can set it to Ping-Pong mode where it will move forward/backward at assigned speeds and intervals. All the settings are assigned using the controls on the device itself. "Speed 1" is the slowest speed of the system and moves at 8" per second, so the Mini is a fairly fast device. There's an RC port that allows you to connect one of various optional controllers available on the market to fully control the device. But in most cases, letting the Mini go completely so you can focus on framing the gimbal shot on your phone during the Mini's route is the way to go. RC port for any third-party remote control. Box Dimensions (LxWxH) 10.1 x 8.4 x 4.7"
Mini Cable Cam is rated 5.0 out of 5 by 1. Rated 5 out of 5 by Jose from AWESOME SHOTS WITH DJI OSMO I got awesome shots with this Mini Cable Cam. I attached my DJI Osmo Pro to this Mini Cable Cam (with included bracket) and I just kept on framing the shots thanks to its full autonomous function which moves the Cable Cam back and forward (across end points you set) until you stop it. It is good for a one man camera operator . Fully recommended for DJI Osmo owners and small gimbals cameras. when will you have for shipping?? At the time of this posting, December 9th 2018, this product is in stock and ready to ship.